Winter has slammed into most of the United States, bringing with it the inevitable bouts of bad weather and hazardous travel. Just look at the massive ice-related highway pile-ups we’ve seen already this season in New York state, Michigan, Oregon — and even closer to home just this past weekend in the Philadelphia area due to a flash-freeze on the roads. If you have a preferred weather or traffic app on your phone, this is the season to fire up those notifications because Mother Nature has a way of throwing a hissy fit and disrupting your plans. If there’s a storm on the way, a highway closed or a train line suspended, odds are you’d like to know about it ahead of time, right? Most specialized apps can be configured to push out alerts to warn you of impending events, so have them ping you when something’s up. Most major mobile platforms — Android, iOS and Windows Phone — let you configure notifications so you can turn them on and when you want. On the weather side, apps include AccuWeather and Weather Undeground for most platforms, DarkSky or NOAA Weather Radar for iOS and dozens of others. Seriously, there are a ton of weather apps for every kind of phone out there and your mobile platform of choice may have even included one. Don’t have a smartphone? 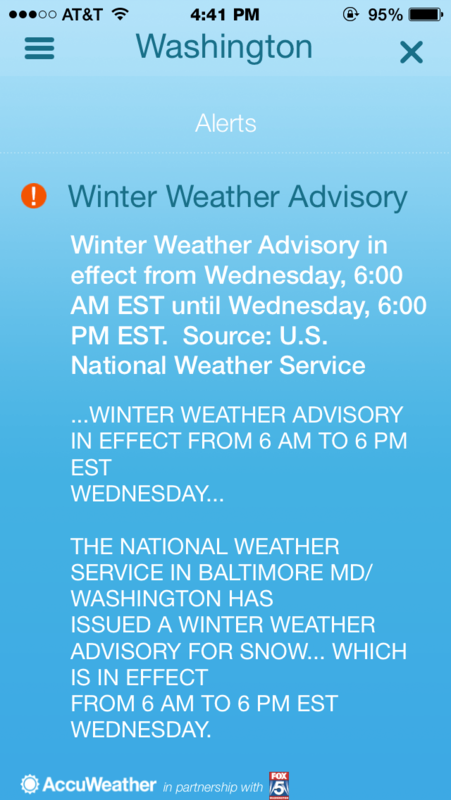 The National Weather Service’s mobile site and sign-up page for third-party email and SMS text alert services can keep you in the loop. As for traffic and transit, popular cross-platform apps like Inrix and Waze are good sources of highway and road information. If you do have to be out driving in bad weather, make sure you have an emergency kit in the trunk. 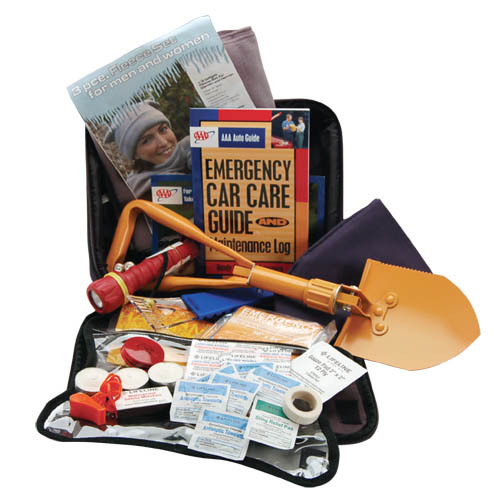 The professional winter states of Wisconsin and Minnesota have especially good advice on this topic, and you can buy pre-made collections, like the AAA’s own Severe Weather Travel Kit. If you don’t have one already, it’s a good idea to get a car charger for your phone — just in case. Weather emergencies can seriously affect mass-transit systems as well, and some more than others. (Seriously, have you ever tried to get around the DC Metro during a snow storm?) If you’re riding the rails, the iTrans app for iOS is available for several cities and offers service alerts. There’s also the Transit app for Android and iOS. If you’re a New Yorker, the New York City Metropolitan Transit Authority has a whole page of mobile apps for various phone platforms to check out. Other information sources, like Google Now (if it has your commute in its list of info cards) and Twitter’s emergency alerts can also be useful. And don’t forget, if you’re trying to fly out for a nice vacation in a warm place, get your airline’s app and sign up for alerts that may affect your flight. It’s winter and in much of the country, that means the roads are a giant asphalt Slushee out there, so let’s be careful. In fact, let’s just stay home and watch some more Agent Carter.